Manado is renown for it’s warm hospitality as well as it’s mouth-watering cuisine and unique authentic culture. From the moment you arrive at Murex Manado the warm-hearted team will make you feel like part of the family. With the world-famous dive sites of the Bunaken Marine Park just a short boat ride away and Manado Bay muck diving sites even closer Murex is perfectly located for exploring these two diverse areas. There are stunning walls and hard corals. You will lose count of the number of turtles in a single dive and look out for reef sharks, schooling fish, sea snakes, passing eagle rays, sting rays, abundant critters and macro life, resident dolphin and pilot whale pods alongside the boat, occasional dugongs, seasonal sperm whale sightings, vibrant and colourful corals. A mix of black and white sand muck and reef diving which is home to some of Indonesia’s rarest and most unique critters including mimic octopus, squid, flamboyant cuttlefish, sea horses and numerous crustacean, nudibranch and frogfish species. For macro underwater photographers Manado Bay dive sites are treasure troves full of opportunities. For a limited period we are inviting you to take advantage of our "Buddy Offer" 1 person pays full price, and their buddy receives a 50% discount on accommodation and diving, giving a shared discount of over £350 per person! Offer is available for a limited period on new bookings departing during June, July & August 2019. Minimum stay is 10 nights, this can be at either resort or a combinations of the two. Prices include flights*, transfers, 10 nights full board in twin share room and 18 guided dives, and if that isn't enough you will also receive unlimited self guided house reef dives on 2 dive days up until 5pm! Murex Manado offers twelve comfortable and spacious garden view bungalows. All accommodation feature 24 hour electricity, en-suite, hot water bathrooms, air conditioning, king size or twin beds, veranda with seating, drinking water, complimentary tea and coffee and free WiFi. Rooms are strategically spread around the landscaped water gardens ensuring a tranquil and relaxing stay for every guest. Your stay at Murex Manado is on a full board basis. Three plentiful buffet meals a day are served in the open-air dining area on the beachfront. Cuisine is varied and combines a tantalizing mix of International and Asian flavours using fresh local ingredients. The team of western trained chefs can cater for special dietary requirements upon request. We can arrange your flights from several UK airports, however Heathrow provides the best prices and connections via Singapore. Transfers are included within your package. Please call or e-mail us for your tailor-made quotation. Kick off your day with a two dive trip to the Bunaken Marine Park which is just 35 minutes away. Look out for the resident spinner dolphin pods that like to play alongside the boats. 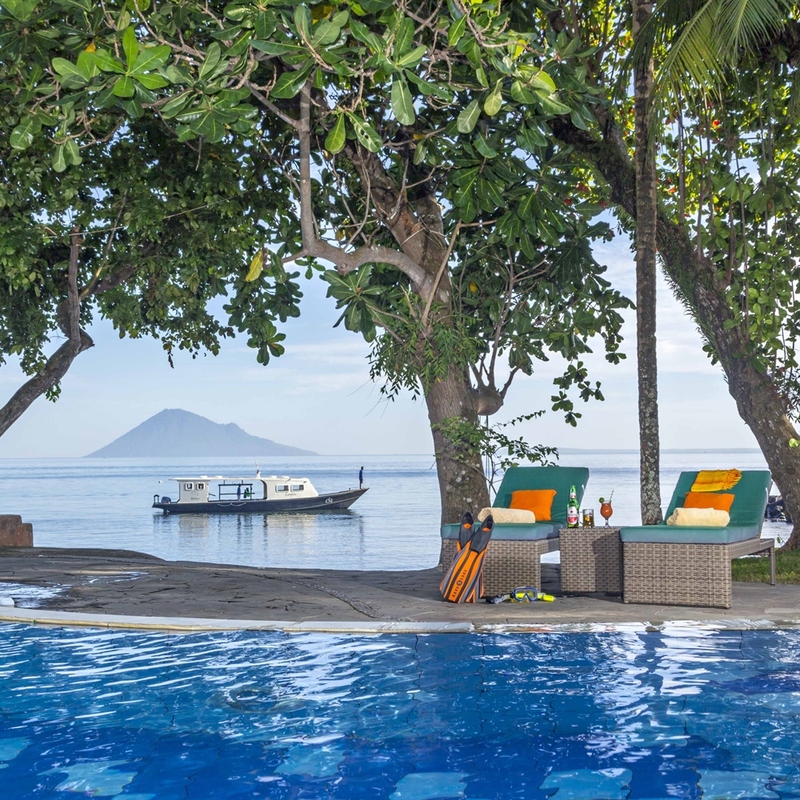 Return to the resort for lunch, followed by a third dive to explore Manado Bay or opt for a three dive safari trip with lunch served on the boat. Please note that when diving in Bunaken Marine Park there is a (one off) Marine Park entry fee of IDR 150,000 per diver / snorkeler. Manado Bay night dives reveal a host of rare critters and are definitely a highlight. Step off the volcanic black sand beach and discover a world of critters and intriguing macro life right on your doorstep. This easy dive site can be explored with or without a guide in buddy pairs. Each diving day you book includes 1 self-guided dive on the house reef. Your stay at Murex Manado can easily combined with a stay on the beautiful island of Bangka, example price would be from £2375 for 5 nights each resort, full board as above and a total of 18 dives, including to 2 dives during a boat transfer between both resorts, as well as complimentary self guided house reef in buddy pairs up until 5pm on guided diving days.